UK retail footfall fell in May by 0.4% on the previous year – a marked improvement over March and April, which recorded declines of 6% and 3.3% respectively, according to the BRC (British Retail Consortium)-Springboard’s monthly monitor. In the four weeks from April 29 to May 26, retail parks saw growth of 0.5% and high streets of enjoyed a rise of 0.6% – but shopping centres continued to see significant year-on-year declines, posting a fall of 2.9%. 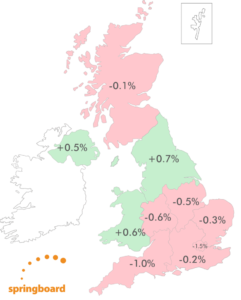 Only three regions saw footfall lift in May: North & Yorkshire (0.7%), Northern Ireland (0.5%) and Wales (0.6%). The biggest decline was in Greater London (1.5%). All regions improved on last month. Springboard Marketing and Insights Director Diane Wehrle said: “It would be highly premature to regard the improvement in UK footfall to -0.4% in May from a drop of -3.3% in April as any form of bounce-back. Instead, at least in part, it’s likely to be a consequence of shopping trips being deferred from April (when the weather continued to be cold and wet) into May. It might also be regarded as a reflection of consumer demand resulting from the two May bank holidays, which anchored the month at both ends. In reality, however, footfall actually declined in both bank holiday weeks, reflecting a long term trend identified by Springboard of the lessening in importance of public holidays for retail. “The greater truth is that with footfall post-5pm continuing to outperform activity during retail trading hours, the overriding characteristic of customer behaviour is firmly one of ‘experience over product’. In May, footfall between 9am and 5pm declined by -1.2% whilst rising by +2% post-5pm. The variance between the two parts of the day is most significant in shopping centres, where daytime footfall dropped by -3.6% compared with a rise of +0.4% post-5pm. BRC chief executive Helen Dickinson OBE added: “May’s better weather resulted in a marginal improvement in footfall across the nation’s high street and out-of-town shopping areas, but it wasn’t enough to overcome the long term trend of declining visits to physical stores. “Consumer behaviour is changing and retailers are continuing to adapt their stores to their customers’ requirements by investing in the integration of their online and bricks-and-mortar businesses, increasingly allowing customers to pick up in-store items purchased online.